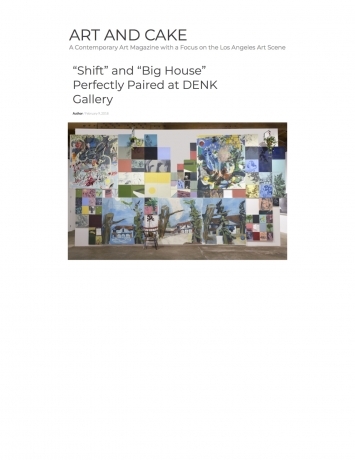 (Los Angeles, CA) - DENK gallery is pleased to announce Big House, a solo exhibition of new work by Los Angeles-based artist Frank J. Stockton. Featuring 15 new paintings unorthodoxly staged as a single installation, Big House presents a dense system of interconnected moments, digressive though intimately allied clusters. Stockton's works tread a fine line between abstraction and representation, combining the figurative with the deliberately gestural and formally abstract to distill personal reflections into nuanced visual metonymies. His paintings are brought to life by the relational power of metaphoric systems, each an isolated though interdependent assertion in a set of contingent visual narratives. A series of personally inflected fictions, memories, and myths, Stockton's works in Big House invoke the often traumatic etymologies of origin stories, whether cultural or personal. Though shaped by self-reflexive offerings, Stockton's vision of dystopian domesticity, where the individual is as flawed as the collective histories to which it lays claim, shift imperceptibly in and out of the private and the cultural realms. Big House focuses on the spaces that contain and define personal experiences of time and memory, while also suggesting a larger conceptual infrastructure that binds the momentary and disparate to a holistic set of systemic architectures - confines and houses, after all, share similar foundations. Charged with frenetic frustration at times and at others, visceral pain, a violent vulnerability courses through the works in representations of even the most mundane and seemingly innocuous subjects. Everyday objects like suburban houses and potted plants take on exaggerated significance as looming edifices and institutions or disproportionate metaphors. The stories that shape us and define our attachments to reality and self are pervasive and non-linear, subject to an ongoing process of absorption, revision and imperfect reiteration. Stockton's installation of process-driven works strives to capture the contingency and temporal fracture of this experiential relationship to memory and story. Like myth, where the localized anecdote takes on universal symbolic significance, so too does Stockton's evasive storytelling hinge on the revelations of the momentary to reveal the structure of the whole. A tree is so much more than just a tree, it's a ghost, and it's a fugitive. Stockton's works are brought to life through deconstruction and reconstitution. Drawing from language and narrative, both integral parts of this process, he balances the formal interests of abstraction with the representational impulse towards storytelling and revelation. Through a series of suggestive superimpositions, traces of the recognizable world bleed in and out of formal gestures and ambient spaces, while an emotive quality permeates the whole refusing the distance of formal disinterest. Like an admission through touch, Stockton's works resonate hauntingly, tendering painting as an oblique confessional. Frank J. Stockton received an MFA from UCLA in 2015 and a BFA from Art Center College of Design in 2005. He completed a residency at Skowhegan School of Painting and Sculpture in 2015 and is currently based out of Los Angeles. Stockton has exhibited throughout the United States and is currently on faculty at California State University at Fullerton, and Moreno Valley College, California.